Conserving nature, clean water, and working lands directly supports the health and well being of our families and communities. 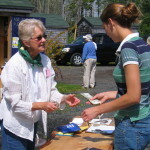 There are many interesting and fun volunteering opportunities through the Land Trust, and we invite you to join us! Volunteer possibilities span from simple one-day events to joining the leadership team and helping to plan our future. You’ll have fun, meet interesting people, and enrich your life. Click on each volunteer opportunity below to see a more detailed description of how you can come and have fun and learn about conservation. Are you looking for a way to invest your energy that will make a difference for our communities? 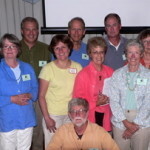 Serving on our Board of Directors or one of our committees offers a way for you to get deeply involved in the serious work of protecting our local environment, educating our communities about the benefits of open space, and supporting our way of life by protecting working farms and forests. 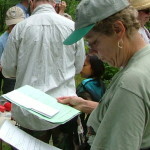 It is also a great way to meet other people in the watershed that share your passion for our mission. Join us in our conservation work and you will amazed at how it will make a positive change in your life! Do you have a favorite section of the Georges Highland Path that you hike frequently? Consider joining our cadre of Trail Adopters where you’ll be contributing to the success of our 55-mile trail system in a healthy and enjoyable way. 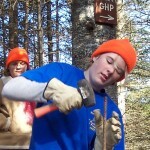 Or, if you only have a day here and there, sign up for our trail work parties with our lively, and hard-working Trails Committee. Becoming a Property Steward for one of over 50 protected properties in the Georges River watershed region, including farms, scenic sites, historic places, woodlands and shorefront properties, will give you access to annually visit the site. You will enjoy providing critical monitoring in a spectacular part of our watershed, learn about the intricacies of our conservation process, work with our Stewardship Program Manager, as well as getting to know the property’s owner. We are always looking for members and friends to help share the watershed story with the public. If you have a special interest that you think would be a good free event for the public, give us a call. We need help planning our free series of Walks & Talks covering topics such as the natural history of the region, leading a hike or paddle, or helping students at conservation fairs learn about our watershed. Bring your special knowledge to a fun event and watch the light come on for others. Join an enthusiastic group of men and women to plan and execute our largest event of the year, our annual Gardens in the Watershed Tour. The Garden Tour Committee has a great time visiting gardens, meeting garden owners, designing the outreach materials, talking with sponsors, and helping in a beautiful garden on tour day. If helping out “behind the scenes” interests you, we have lots to do throughout the year in our busy office. While surrounded by maps of the watershed and pictures of its natural beauty, you can help us keep organized and efficient as we work to protect the stunning region around us. Graphic design, data entry, filing, mailings, photocopying, and much more. It’s a great way to get to know our staff, work with other volunteers, and keep us operating at top efficiency. If any of these opportunities appeal to you, or if you have a great idea about other ways you can help us out, contact us today!